The Free Beacon first reported last week that Congress is actively working to see Al Jazeera designated under FARA following a secret effort last year to spy on the American Jewish community as part of a documentary it claims will expose Jewish control of the media. Al Jazeera has been sending letters to a slew of Jewish organizations and pro-Israel individuals asking them to comment on what appears to be secret recordings that the news outlet claims confirms Jewish meddling in foreign affairs. Al Jazeera's actions are being viewed as tantamount to a foreign-funded spy operation on U.S. citizens conducted on American soil. In light of this spy effort, Gottheimer and Zeldin are seeking support for an effort to force Al Jazeera to register as a foreign agent under FARA. "American citizens deserve to know whether the information and news media they consume is impartial, or if it is deceptive propaganda pushed by foreign nations," the lawmakers write in a draft letter to the DOJ that is currently circulating on Capitol Hill. A copy of that letter was obtained by the Free Beacon. This would put Al Jazeera in the same category as state-funded propaganda outlets such as RT, a Russian-controlled outlet that was recently forced to register under FARA as part of a similar push. "Congress needs clarification as to whether additional foreign principals should also be required to register under FARA, including Qatar's Al Jazeera, which the U.S. State Department has indicated is state-controlled," the lawmakers write. The lawmakers reference the Al Jazeera spy operation on the American Jewish community as evidence the outlet is operating on behalf of Qatar, which continues to finance terrorism. "Furthermore, Al Jazeera's record of radical anti-American, anti-Semitic, and anti-Israel broadcasts warrants scrutiny from regulators to determine whether this network is in violation of U.S. law," the letter continues. "Such an investigation should cover the full range of activities undertaken by Al Jazeera in the United States, including reports that it infiltrated American … nonprofit organizations." The lawmakers request the DOJ open an investigation into Al Jazeera and "provide our offices with detailed information about the DOJ's investigative process, and whether additional entities, including Al Jazeera, meet the legal definition of ‘foreign principal,'" according to the letter. 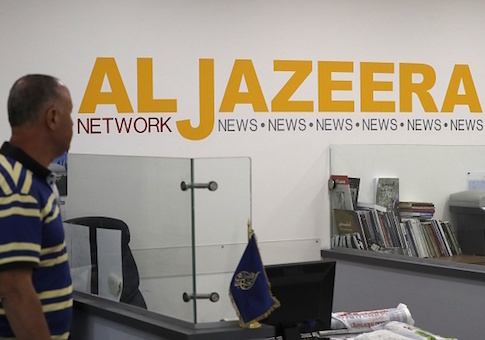 One veteran congressional adviser familiar with the effort told the Free Beacon that Al Jazeera's latest efforts to infiltrate the American Jewish community shows its strings are being pulled by the Qatari government. "After confirming its state sponsored espionage, the case for FARA is a slam dunk," the source said. "And now we see Congress is pressuring the administration to do the right thing. AJ doesn't have any friends on Capitol Hill, so the Trump administration should be taking this pressure seriously." "When foreign governments are sending secret spies to infiltrate Washington-based organizations, Congress understands its time to act," the source added. "When you engineer a sophisticated, covert anti-Semitic surveillance program on U.S. soil, there must be consequences," the source said. "A strong response is needed from both the administration and Congress." Disclosure: A current Free Beacon staffer received a similar letter from Al Jazeera in relation to her work for a previous employer. This entry was posted in National Security and tagged Al Jazeera, Qatar. Bookmark the permalink.